One established tradition in our legal system is that lawyers who wish to carry on practice as legal practitioners shall participate in and satisfy the requirements of ‘Continuing Professional Development’, this rule has been deep-rooted through practice in conjunction with the backing of law. Our above stated obligation as lawyers in this vein, ushers in, however, a bit of conundrum to many. Why so? It is observed that the body tasked with the responsibility of administering the mandatory Continuing Professional Development (CPD) Program is the Nigerian Bar Association. This trend has been accepted since the repeal of the Legal Education Act 1962 which had earlier established the Nigerian Institute for Continuing Legal Education. Nevertheless, the laws empowering a body such as the NBA to administer this function appear to be at variance with each other. “The Council (of legal education) shall in addition to the function conferred on it by section 1 (2) of this Act have responsibility for those matters in respect of which, before the commencement of this Act, the Nigerian Institute for Continuing Legal Education had the responsibility”. Clearly the dichotomy between this enabling provisions is centered on the question, who should be the body administering the function of continuous learning for legal practitioners? It is glaring, however, to note that the functions of these bodies are not codified into a single document. The Rules of Professional Conduct highlight some of the duties of the NBA as well as the Legal Practitioners Act. 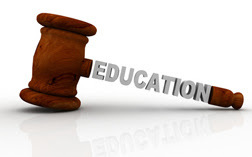 The Council of legal Education on the other hand derives legitimacy from the Legal Education Act and its functions are stipulated therein with support from the Legal Practitioners Act. At this junction, the principle as has been interpreted by the most superior court in case of University of Lagos v. Aigoro (1985) NWLR (Pt. 1) 143 must be applied, therein the court was of the opinion that when there is variance in a legal position between the “Act” and the “Rule” the Act shall supersede. Flowing from this train of thought, the Rules of Professional conduct as made under the powers of the AG federation which empowers the NBA to take up the function of Continuous Legal Education, must give way to the Legal Education Act, as made under by National Assembly, which provides that the Council of Legal Education is in truth, the right body to handle such mantle. The Nigerian Law School is established as the teaching arm of the Council of Legal Education as empowered by Section 1 (2) of the Legal Education (Consolidation) Act. Before now, the Nigerian Law School has only performed the function of churning out new wigs. The provisions of the law, as seen in Section 3 of the Legal Education (Consolidation) Act, obviously demands more than this singular function. Conclusively, many who are of the view that the NBA should carry out its function notwithstanding the principle and position of law are strongly advised to canvass for the repeal or amendment of the enabling Act.